When buckthorn moves in to the ecosystem, it dominates. Imagine a friend invites you to a dinner party, promising a delicious spread of food and libations. You arrive, excited and hungry, only to find nothing but raw kale, brought by an uninvited guest. Regardless of your feelings about kale, this would be pretty underwhelming. The other guests are obviously disappointed about the monotonous spread. Most people leave, and because most people aren’t eating the kale, the kale continues to dominate the party. Even if someone brought in better foods that more people enjoy, there is no room on the tables. The kale is everywhere! While not a perfect analogy, this anecdote relays the reasons why buckthorn invasion is detrimental to forest ecosystems. The dinner guests are like the other plants and animals that usually live in the woods. They have certain dietary needs, and if those needs cannot be met, they will have to leave and find another place to live. The more one species dominates (kale, or in many local forests, buckthorn) the fewer species can live there, leading to the ecological equivalent of a party that ends at 8:30, just as everyone was arriving. While it may be true that one person at the party really likes kale, it’s hardly fair for the preferences of that person to supersede everyone else’s needs. 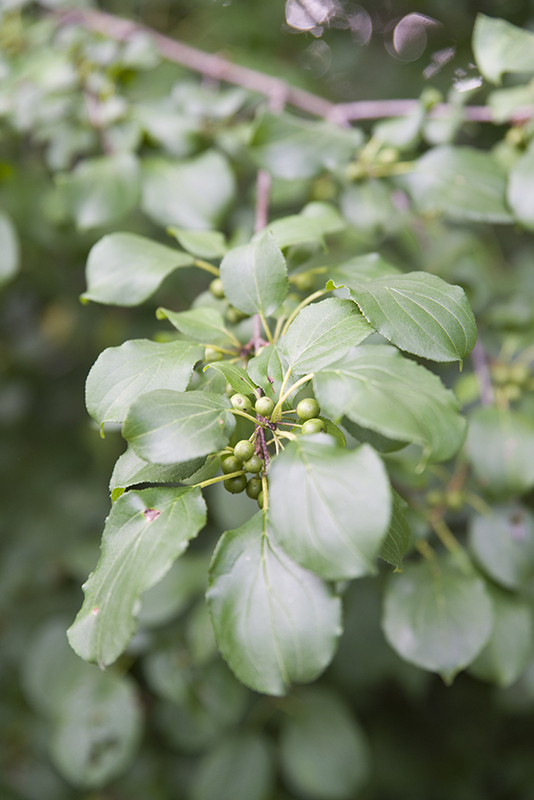 In the case of buckthorn, many have opposed its removal because that denies robins a berry that they enjoy. However, keeping the buckthorn (which doesn’t belong there in the first place) is like keeping all of the kale on the tables and not allowing for other foods to be served just for that one person. Even more frustrating, the person that likes kale has plenty of other dietary options. Kale isn’t even their favorite food! The McDonald woods shows healthy filtered sunlight and native plant understory growth after buckthorn removal. To many people, the idea of cutting down trees to help forests grow stronger is counterintuitive. But buckthorn is no ordinary tree. It is an invasive species, meaning that it doesn’t belong in Chicago area forests, and it steals resources from the plants that are supposed to live here. So remember, when you hear people talking about cutting down buckthorn, they are actually doing it to make the habitat healthier and more inclusive in the long term. They are working to replace the kale at the party with better food and drinks, ensuring that all the guests that were invited can have a good time, staying up until sunrise. Read more about our ongoing buckthorn battle, and see the difference removal makes in restoring an ecosystem. 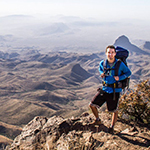 Bob Sherman is an undergraduate studying environmental science at Northwestern University. His research interests include prairie restoration and how abiotic factors impact prairie and forest ecosystems. He hopes that his research will have a positive impact on ecosystem restoration and management. Posted on June 17, 2016 June 17, 2016 Author Guest BloggerCategories Plant Science & ConservationTags #60secondscience, botany basics, botany for kids, Buckthorn, buckthorn removal, ecosystem restoration5 Comments on 60-Second Science: Begone, Buckthorn! Standing guard along the western shore of Lake Michigan, the ravines are a naturally engineered filtration system from land to water. Curving up from the flat lands of Illinois and arching alongside the coast into Wisconsin, their hills and valleys are filled with an abundance of foliage, plants, and animal life unlike any other ecosystem in the Chicago Wilderness region. Among other benefits, they help to filter rainwater. Rare plants, migratory birds, remnant woodlands, and fish are a part of this shadowed world that has long been entrenched in mystery for local residents and scientists alike. As urbanization, erosion, increasingly intense weather events, and invasive plants begin to peel away at the perimeter of the ravines, it has become increasingly urgent for us to unwrap those mysteries and help protect the system that has long protected us. New volunteers are welcome to dig in this spring and summer. Register to begin by attending a new volunteer workshop. Volunteers and staff sample vegetation along a bluff transect at Openlands Lakeshore Preserve. “The ravines are one of Illinois’s last natural drainage systems to the lake,” said Rachel Goad, manager of the Chicago Botanic Garden’s Plants of Concern program. “They are delicate landscapes. It can be challenging to get in to them. It can be challenging to move around on the steep slopes.” Those challenges have not deterred Goad and a team of citizen scientists from digging in to look for solutions. For 15 years, the many contributors to Plants of Concern have been collecting data in the ravines, with a particular focus on the rare plant species that can be found there. The data, now quite valuable due to its longevity, is a treasure chest for land managers and others who are trying to better understand the system and how to save it. Goad and her team are now in the final stages of testing a vegetation assessment connected to a virtual field guide for the ravines. She hopes it will be completed by the end of this year. Its purpose is to serve as a resource for ravine restoration and management long term. The plant-focused sampling method, called a rapid assessment, is the third piece of a larger ravine-management toolkit that includes a way to evaluate erosion and stream invertebrates considered to be indicator species. The toolkit has been assembled by Plants of Concern and partner organizations in recent years. The data, however, is only one piece of the solution. Goad believes the connections people make when monitoring the ravines are what will impress upon them the significance and urgency of the issue. Her goals are to create connections between people and their local natural communities, and to engage a more diverse representation of volunteers in the program. “What Plants of Concern is doing is engaging local citizens, introducing them to ravines, and getting them interested in what’s happening in these mysterious V-shaped valleys around them,” said Goad. In all, Plants of Concern monitors 288 species across 1170 populations in 15 counties, covering 13 habitat types. 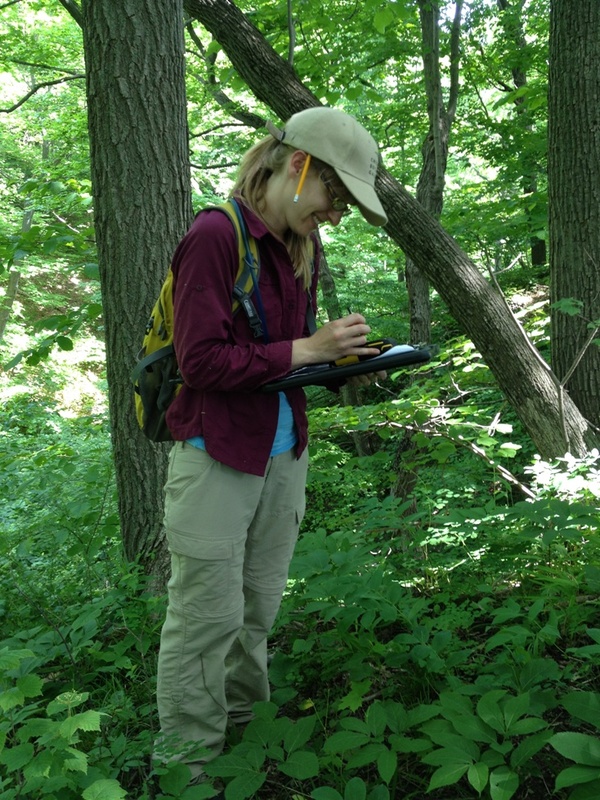 Rachel Goad monitors rare plants in a ravine. Goad hopes that by growing connections between these ravines and those who live nearby, she can increase the chances that this system will continue to protect rare plant species and one of the largest sources of drinking water in the world. As a recent recipient of a Toyota TogetherGreen Fellowship, administered by Audubon, Goad is intent on better understanding how to build such connections. “We are working to make connections between monitoring and stewardship,” she said. 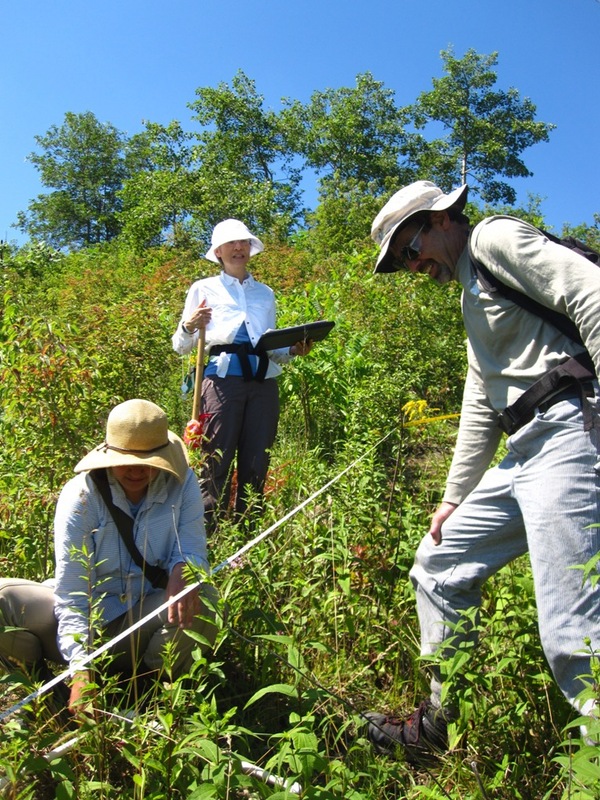 “Monitoring can be a transformative experience.” Once a volunteer is in the field, navigating the terrain and gaining familiarity, they learn to see existing threats, such as encroachment by invasive species. Documenting these threats is important, but can feel disempowering if they’re not being addressed. Goad wants to show volunteers that there is something that can be done about the problems they encounter, and build a proactive understanding of conservation. “I believe in citizen science, which is the idea that anybody can do science and get involved in research,” she said. Goad stepped in as manager of Plants of Concern just last year, after earning her master’s degree. It was like returning home in some ways, as she had previously helped to manage natural areas at the Garden. 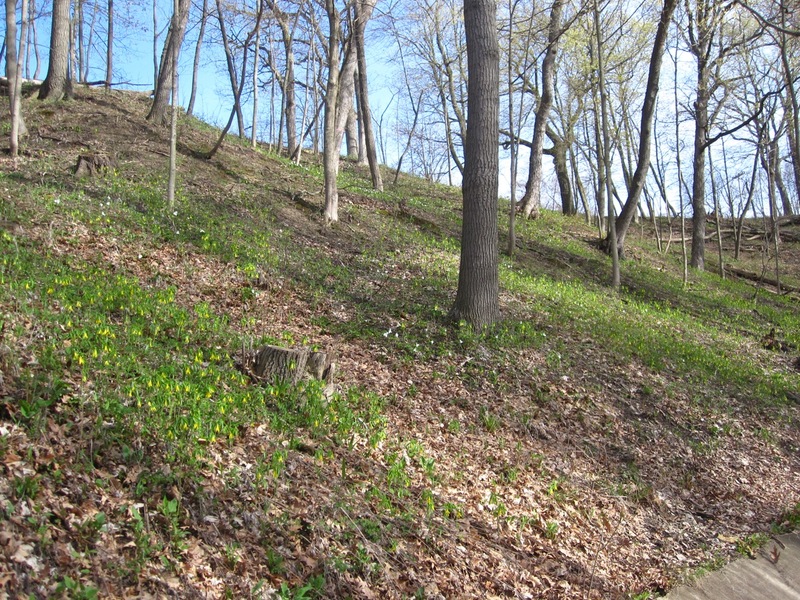 Early spring ephemerals bloom on a ravine bluff. 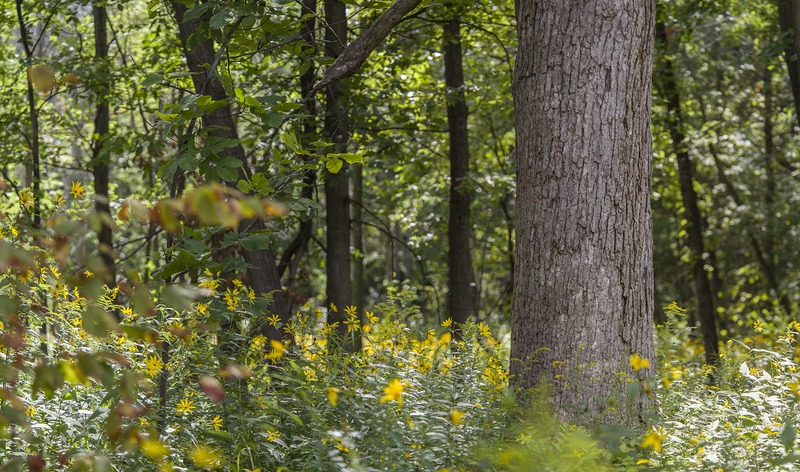 Plants of Concern has been a mainstay at the Garden for 15 years, dispatching committed volunteers to the ravines and other key locations across the Chicago Wilderness region to monitor and collect data on endangered, threatened, and rare species. The mounting data collected by the program is often used as baseline information for shifting or struggling species, and is shared with land managers. Through special projects, such as with one of the Garden’s recent REU interns, they have also contributed to habitat suitability modeling for rare species. I’m a conservation scientist here at the Chicago Botanic Garden. I have an incredible job that allows me to work with many wonderful graduate students and a team of researchers to study ways to restore natural areas in the Colorado Plateau. If you’ve ever visited national parks like the Grand Canyon or Arches, you’ve experienced at least some of what the Colorado Plateau (also known as the Four Corners region) has to offer. It includes more than 80 million acres across Utah, Colorado, New Mexico, and Arizona—and the largest concentration of national parks in the country. Our research team heads out across a recently-burned area in search of data. Although beautiful, the Colorado Plateau’s natural areas are facing many threats, including wildfires, a changing climate, and destructive invasive species such as cheatgrass (Bromus tectorum) and Russian knapweed (Acroptilon repens). 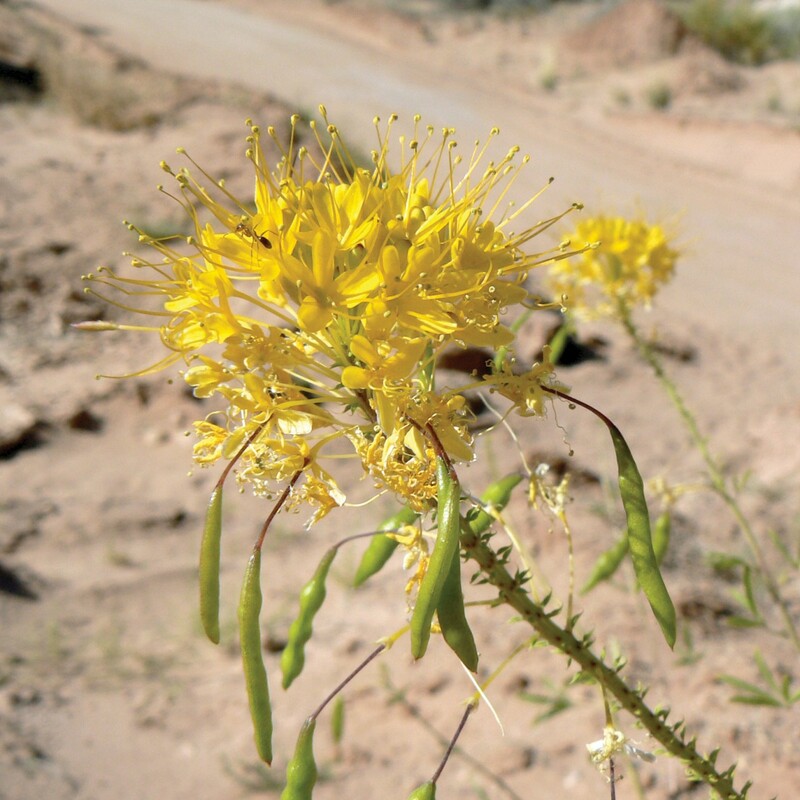 Working with many partners, including the Bureau of Land Management, we are studying which native plants may be best able to handle these growing threats (we refer to them as “native winners”). 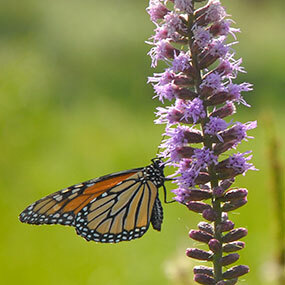 The ultimate goal is to help make restoration of these plants and habitats as effective as possible in order to maintain healthy natural areas that support wildlife and pollinators, and help keep our air and water clean. This is no small task. The invasive species that the native plants are up against are very impressive. 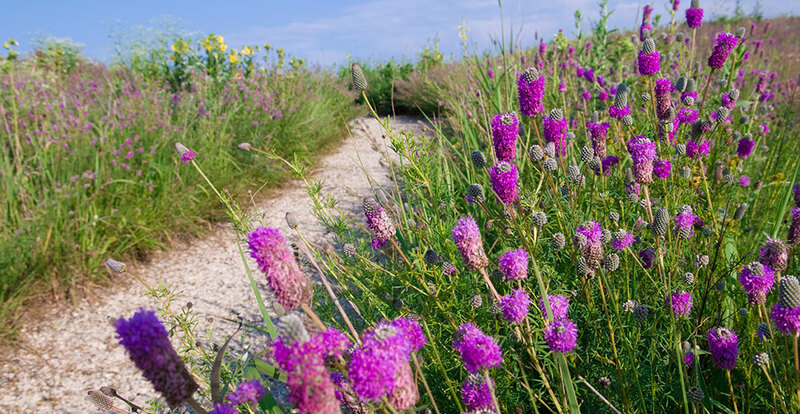 For example, Russian knapweed is allelopathic (prevents other plants from growing nearby), and it has roots that can grow more than 20 feet deep, seeking the water table. Fortunately, some native species are also able to grow in these conditions, and some even appear to be evolving and adapting to be better competitors. Three Northwestern University graduate students are working with me. Master’s student Nora Talkington is testing how different populations of a native grass are able to compete with Russian knapweed, while doctoral student Alicia Foxx is researching how different root structures of native plants help them compete with invasive species. 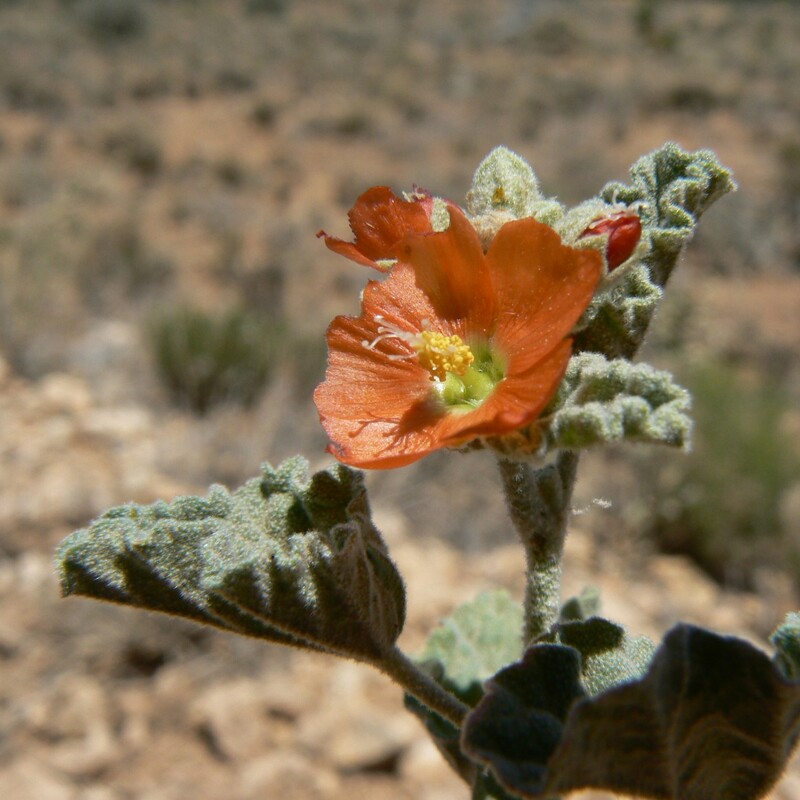 Master’s student Maggie Eshleman is studying six native wildflower species including the smallflower globe mallow (Sphaeralcea parvifolia), which has tiny, fiery orange flowers. These wildflowers are likely “native winners” and are strong candidates for increased use when restoring habitat in the Colorado Plateau. 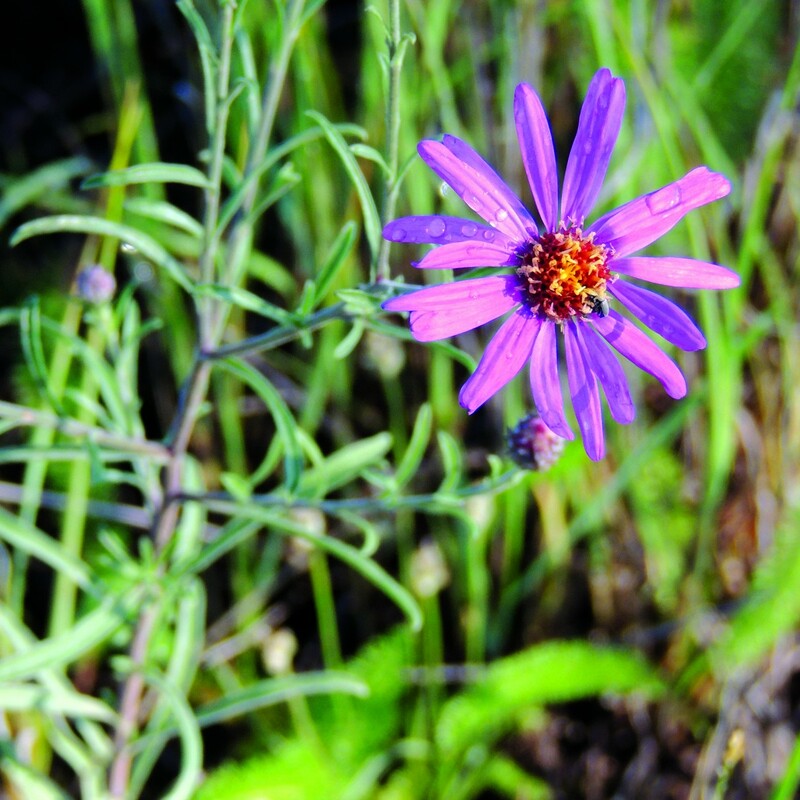 Tansy aster (Machaeranthera canescens): This purple-flowered plant is good for pollinators, one of the few plants that flowers late in the season, and on top of that, is really good at growing in sites that need to be restored. 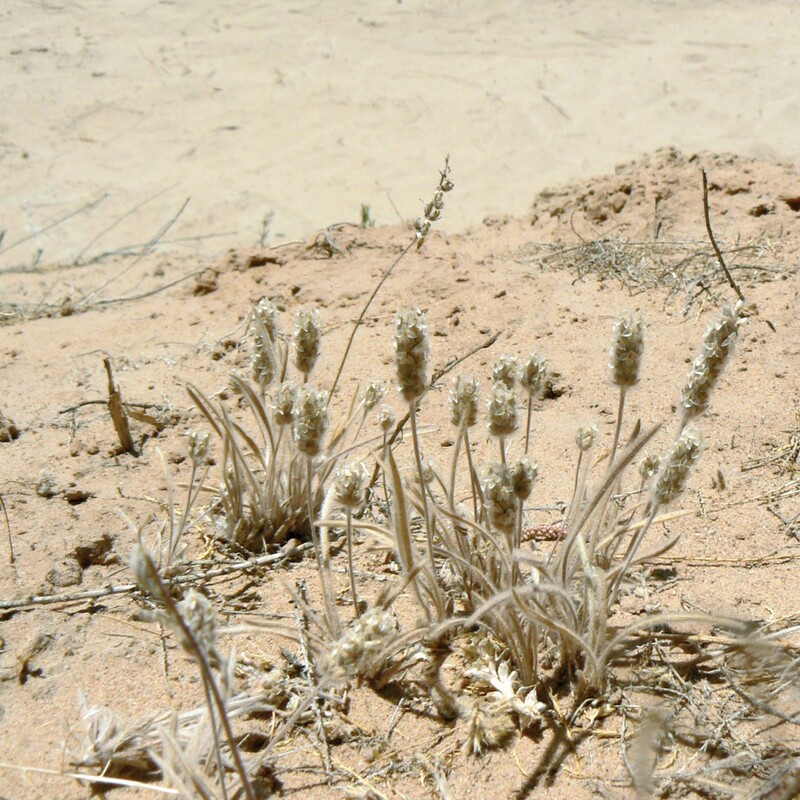 Woolly plantain (Plantago patagonica): This cute little annual plant is often the only thing we find flowering and producing seeds during extreme drought years. It is very impressive! Bee plant (Cleome lutea): This annual plant has gorgeous yellow flowers. It’s good at growing in disturbed areas and, as its name indicates, is a great forage plant for bees. This summer was a busy one. 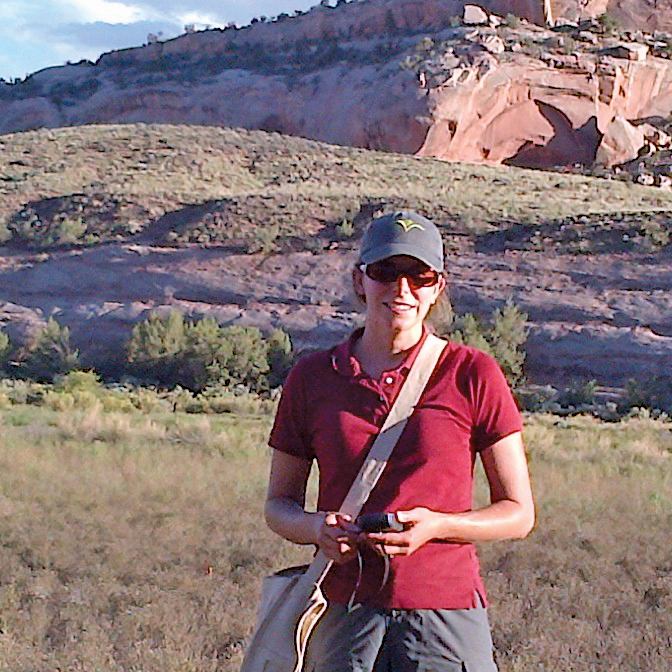 My students and I spent many weeks in the Colorado Plateau working with collaborators to collect seeds (as part of Seeds of Success collectors—a national native seed collection program). These seeds are now being used for studies in the Garden’s research greenhouses and growth chambers, and at study plots in Utah, Arizona, and Colorado. In the Garden’s Daniel F. and Ada L. Rice Plant Conservation Science Center, we are also using incubators to create spring- and summer-like conditions that will help us understand when and why seeds of certain species are able to germinate and grow. This is an important aspect of ultimately being able to restore species in a degraded habitat. How cool is it to be able to take research that’s been done on a small scale and actually apply it to the real world? I feel so lucky to be able to do this work, and being here at the Chicago Botanic Garden has allowed me to build long-term partnerships that investigate the application of research, rather than just focusing on publishing it. Stay tuned for updates on how these native winners perform. This post was adapted from an article by Nina Koziol that appeared in the winter 2014 edition of Keep Growing, the member magazine of the Chicago Botanic Garden.